Neil MacGregor, former Director of the British Museum, brings to an end his object-based history. During the past four weeks he has taken artefacts from William Shakespeare's time and explored how Elizabethan and Jacobean playgoers made sense of the unstable and rapidly changing world in which they lived. With old certainties shifting around them, in a time of political and religious unrest and economic expansion, Neil asked what the plays would have meant to the public when they were first performed. Carefully selected objects shed light on the great issues of the day that preoccupied the public and helped shape the works, and revealed much about the concerns and beliefs of Shakespearean England. 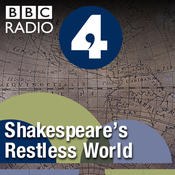 In this, the final programme of the series, Neil considers how William Shakespeare made the transition from successful playwright to possibly the greatest dramatist the world has known Programme 20 SHAKESPEARE GOES GLOBAL - The publication of the First Folio of Shakespeare's collected plays in 1623 began the process of turning an early modern playwright into a global phenomenon. An annotated copy of the Collected Works of Shakespeare reveals the extent to which Shakespeare has inspired and influenced audiences across the globe and through the ages. This programme was originally broadcast in 2012. Producer: Paul Kobrak. Neil MacGregor, former Director of the British Museum, continues his object-based history. Taking artefacts from William Shakespeare's time, he explores how Elizabethan and Jacobean playgoers made sense of the unstable and rapidly changing world in which they lived. With old certainties shifting around them, in a time of political and religious unrest and economic expansion, Neil asks what the plays would have meant to the public when they were first performed. He uses carefully selected objects to explore the great issues of the day that preoccupied the public and helped shape the works, and he considers what they can reveal about the concerns and beliefs of Shakespearean England. Programme 19. THE THEATRES OF CRUELTY - A human eyeball in a silver setting provides a striking insight to the theatre of cruelty in Elizabethan and Jacobean Britain. This programme was originally broadcast in 2012. Producer: Paul Kobrak. Neil MacGregor, former Director of the British Museum, continues his object-based history. Taking artefacts from William Shakespeare's time, he explores how Elizabethan and Jacobean playgoers made sense of the unstable and rapidly changing world in which they lived. With old certainties shifting around them, in a time of political and religious unrest and economic expansion, Neil asks what the plays would have meant to the public when they were first performed. He uses carefully selected objects to explore the great issues of the day that preoccupied the public and helped shape the works, and he considers what they can reveal about the concerns and beliefs of Shakespearean England. Programme 18. LONDON BECOMES ROME - A set of designs for the Coronation Procession of James I reveals the extent of classical knowledge amongst Shakespeare's audience. This programme was originally broadcast in 2012. Producer: Paul Kobrak. Neil MacGregor, former Director of the British Museum, continues his object-based history. Taking artefacts from William Shakespeare's time, he explores how Elizabethan and Jacobean playgoers made sense of the unstable and rapidly changing world in which they lived. With old certainties shifting around them, in a time of political and religious unrest and economic expansion, Neil asks what the plays would have meant to the public when they were first performed. He uses carefully selected objects to explore the great issues of the day that preoccupied the public and helped shape the works, and he considers what they can reveal about the concerns and beliefs of Shakespearean England. Programme 17. PLAGUE & THE PLAYHOUSE - May 1603 saw not only a new king but the worst plague outbreak since the Black Death. Its impact and reach is told through a series of early seventeenth century proclamations. This programme was originally broadcast in 2012. Producer: Paul Kobrak. Neil MacGregor, former Director of the British Museum, enters the final week of his object-based history. Taking artefacts from William Shakespeare's time, he explores how Elizabethan and Jacobean playgoers made sense of the unstable and rapidly changing world in which they lived. With old certainties shifting around them, in a time of political and religious unrest and economic expansion, Neil asks what the plays would have meant to the public when they were first performed. He uses carefully selected objects to explore the great issues of the day that preoccupied the public and helped shape the works, and he considers what they can reveal about the concerns and beliefs of Shakespearean England. Programme 16 A TIME OF CHANGE, A CHANGE OF TIME - A rare domestic clock with an equally rare minute hand and quarter-hour chimes reveals the changing relationship Shakespeare's audiences had to time. This programme was originally broadcast in 2012. Producer: Paul Kobrak.